Arrested Caries is a type of Dental Caries affecting Teeth which are basically Caries which has become stationary or non-progressive or static without any signs of further progression or extending into the Enamel or dentist structure. Arrested Carious Lesion is usually Self-cleansing and is usually seen on the lingual or labial surfaces of the tooth. Due to the Self-cleaning property, there is a lack of any Food impaction or retention in the Arrested Carious lesion. Arrested Caries is usually hard and glossy, it is due to the fact that the top layer of soft and decalcified Enamel (affected by caries) is lost due to the masticatory movements and forces and this leads to a brownish/black and polished/shiny surface which is hard in consistency. If arrested caries involves Dentin, it is called as – Eburnated Dentin. Sclerosis of Dentinal Tubules is seen and secondary dentin formation commonly occurs in arrested caries. In the Interproximal surface, the Arrested caries is located below the contact point of adjacent teeth and it appears brown in color. (usually seen after extraction of the adjacent tooth). This is because the Caries process has stopped after the removal of the tooth and it becomes self-cleaning. A Carious lesion which is halted in progression and starts to Remineralize is called as Arrested Caries, so the Enamel or Dentin structure which is present in the Carious lesion is discolored and hence it is seen as Black or Brown color in Arrested Caries. The Change in color is also due to the “Entrapment of organic debris and metallic ions within the Remineralized Enamel“ giving the Black color to it. 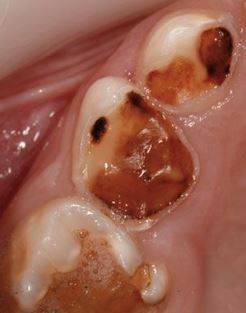 The brown color is also seen in the Early form of the carious lesion which has turned into arrested caries. Development of Arrested Caries is divided into three Stages based on the stage of Dissolution and Crystallization of the Carious lesion. Stage 1 or First Stage: Minerals in the intertubular dentin has started to dissolve due to Acids produced by Bacteria. The accumulation of fluid in the tubules becomes saturated with calcium and magnesium ions. Stage 2 or Second Stage: The Saturated Crystals start precipitation and lead to the formation of large crystals of tricalcium phosphate. Stage 3 or Third Stage: Collagen in secreted into the dentin tubules due to Odontoblast process, this leads to blockage of the tubules with Hydroxyapatite crystals. The Growth of crystals takes place in the intertubular dentin. According to Muhler, caries arrest has been seen after application of Stannous fluoride solution on tooth surfaces having carious lesions. Application of Stannous Fluoride on surfaces with incipient carious lesions, demineralized areas, etching or frank carious lesions. These surfaces started to show signs of Arrested Carious lesions.